Watches often have engravings or personalizations on the back. Most collectors I know don't mind a personalized watch, as long as it's done well. In fact, I personally prefer Christmas watches, even over non-personalized examples, as I think they are extra special. But that's just me. There is one type of watch that I also think is special - and that are watches that Hamilton gave to their own employees. This was a practice they started in the 1940's and you will occasionally see them come up for sale. Hamilton awards are often engraved with, "To a Craftsman a product of his craft..." which I'm sure was very fitting. I do find it a bit ironic sometimes though, as often the watch contains a Swiss-made movement. I suspect the recipient got to choose the model though, so I doubt anyone ever felt slighted by their award. In fact, if you wanted an automatic model, the only movements available were Swiss made and that was the case with my project watch. It's a 1959 Thin-o-matic T-200. 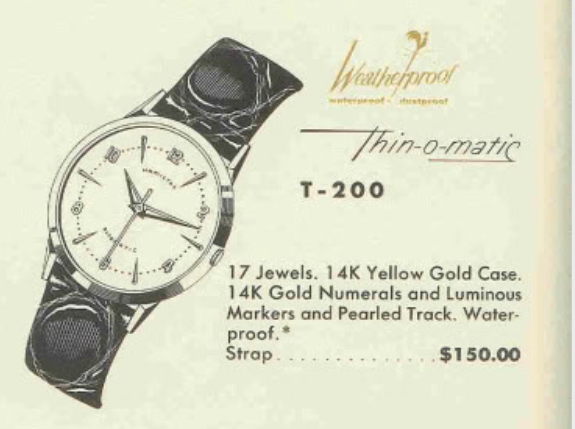 This award watch was received the very first year that Thin-o-matics were introduced, so I'm sure it was very special. The T-200 continued to be produced through 1963. Being a 200-series watch, the case is solid 14K gold. It features a butler-finished dial with solid 14K gold numerals and markers too. My project watch came courtesy of another collector who needed help with it. Upon arrival I didn't realize it was an awards watch so I was puzzled by the distinctive H logo on the dial. This stylized H came about when the company acquired the A. Huguenin Fils watch company of Bienne, Switzerland in the late 1950s. You'll see that logo on Hamilton as well as Huguenin watches. The back of the watch has the classic Hamilton presentation to employees. When I clean the case I'll take extra care to not damage the engraving. 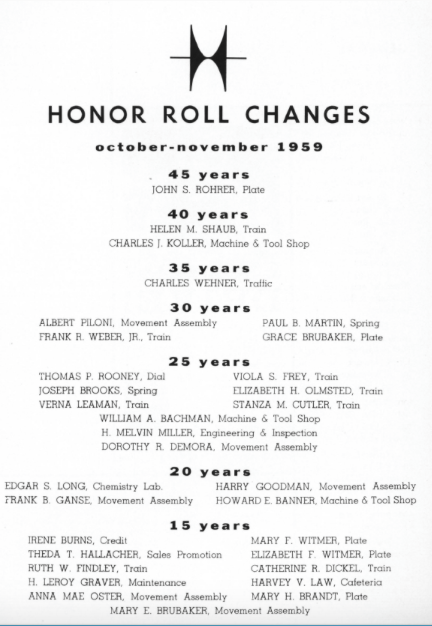 A fellow collector helped to do some research on the watch and found out who Harvey Law was. Turns out, he worked in the cafeteria. How's that for a company that valued it's employees? Looking at the movement, it looks like it's due for a cleaning. The only issues I noticed is if I try to set the time the crown with rotate off - so it needs to be tightened onto the stem. Also, the rotor doesn't want to swing. Maybe it's gummed up. I'll have to investigate further. I don't see any watchmaker's marks inside. I wonder if this watch has even been overhauled before? Well, the reason the rotor won't spin is the arbor framework is bent. Notice there's a slight gap at the base, on the right. From a different angle, you might be able to see the slight bend that causes the weight to rub when it swings towards the center of the movement. The framework is held in place with three screws with a series of wheels underneath. The the framework removed, you can surely see the bend now. It should be perpendicular. I'll try to press the part back to flush but since I don't know why it failed, I'm not convinced that this is a good repair. Plus there's a good chance I'll crack the jewel inside the post. Yup, the jewel cracked. Oh well, I have a donor part that I intended to use anyway. The staking process was really plan B, I'd rather use a part I know is right than one that I "hope" is right. Everything gets thoroughly cleaned and dried. The hands still had radium paint on them so I removed that in the ultrasonic too. It was starting to take it's toll on the finish of the dial and removing it stops that process. It didn't glow anymore so new paint will be a nice addition. The hard part of reassembly is complete. Now I just need to reinstall the balance and it's jewels. Success. The watch is ticking away with good motion. It's off to the timer to listen to how well it's ticking. Not too shabby. The beat error of 1.6ms is acceptable to me. It's hard to adjust on this movement and I'd rather not goof up an otherwise good balance and hairspring. I'll slow it down a smidgen and then let it settle in. The oscillating weight / rotor goes back onto the post and it's now swinging nicely, just as it should. Fresh lume on the hands and the pointed markers freshens up the watch nicely and will keep the center of the dial from toning further. I polished the crystal so it looks factory-fresh too. The dial has some minor age spots but it looks a lot better than my merciless camera makes it out to be. This fine Hamilton awards watch is ready for another 50 years of service. Hopefully it won't wait another 50 years before it sees another watchmaker for a cleaning. That should be done every 4-5 years. Great work, any ideas how an arbor framework gets bent that much? My money is on being dropped. Fortunately the shock jewels spared the balance staff. Hi - very interesting! I just bought this exact model. Any health risks wearing this watch from the radium on the dial (radiation or the secondary radon)? Don’t eat it and you’ll be fine.